This was a game that I will be telling my childern 20 years from now. 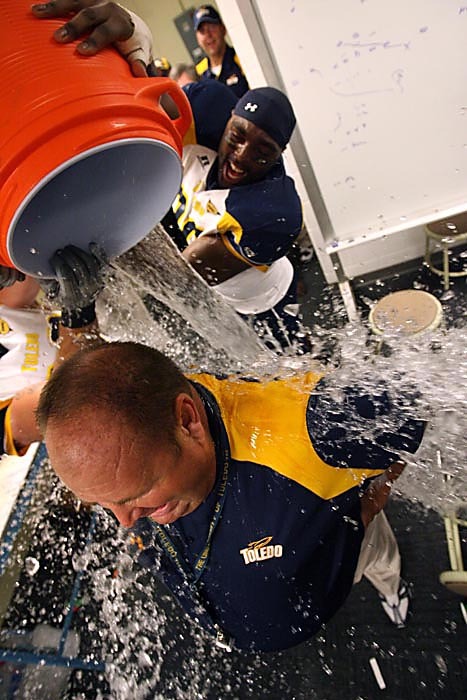 Now the Univesity of Toledo who lost their last 3 games and went into the Big House being a 17 point under dog and defeating the Universit of Michigan. 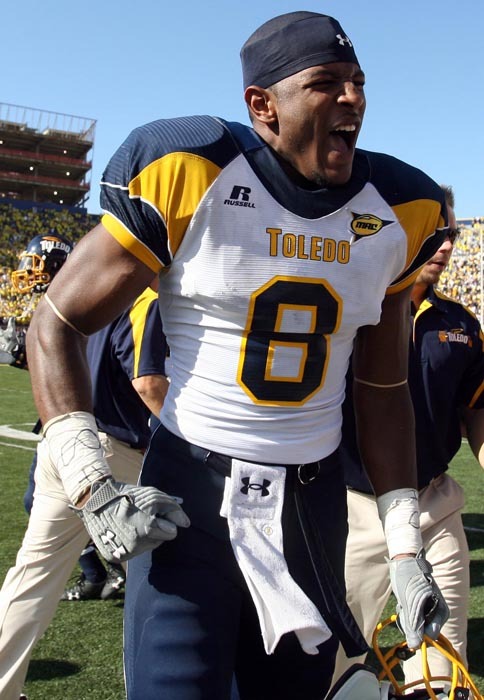 Toledo was the first Mid American Conference team to beat Michigan. Being part of the football team makes it even a cooler experience, I didn’t dress for this game but I did travel with the team to the game. Being on the team gives me opportunites that most other photographers can’t get. I allowed to shoot in the locker room, I am allowed to stand right in with the team and just try different thing that most other photographers don’t get. Toledo is about 45 mintues from Ann Arbor so me and 4 other team mates who don’t travel made the trip up to the Big House to support the rest of our team. 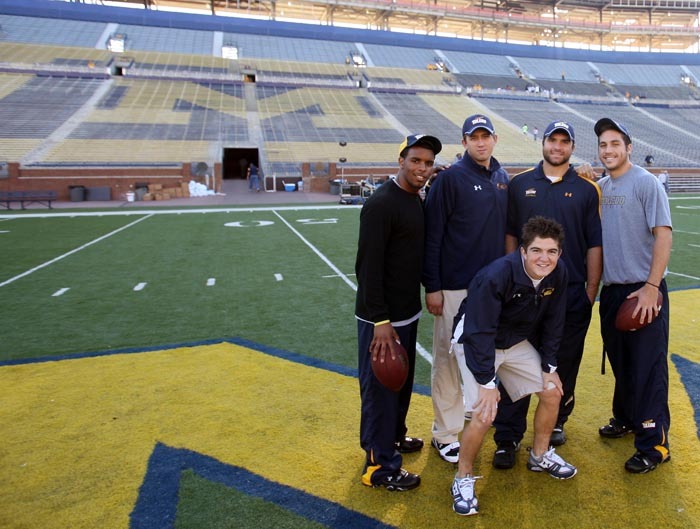 We arrived at the Big House around 9:30 so that gave us plenty of time to mess around on the field while the stadium was empty and act like little kids. We also did a group photos of Tim Cortozo’s Travel Squad! Then the team arrived to the stadium around 10:30 so we went into the locker room to talk to them pumped. I hung out with the equipment staff for a while until the Kickers went out to warm up around 11:00 just about an hour before game time. Started working on some stanard mug shots of players since they all tell me get some pics of me man and when you get caught up shooting the game you totally forget about that so pregame is a good time to get those. Then as the team started walking down the tunnel to the roaring crowd of 107,000 people I fired off a few shots of tem walking down the tunnel. Then it was time for kick off and the crowd went wild! The game was pretty boring until about half way through the first quarter when Trylle Herbet intercepted a pass in the endzone and retured it 100 yards for the longest interception return in the Big House. 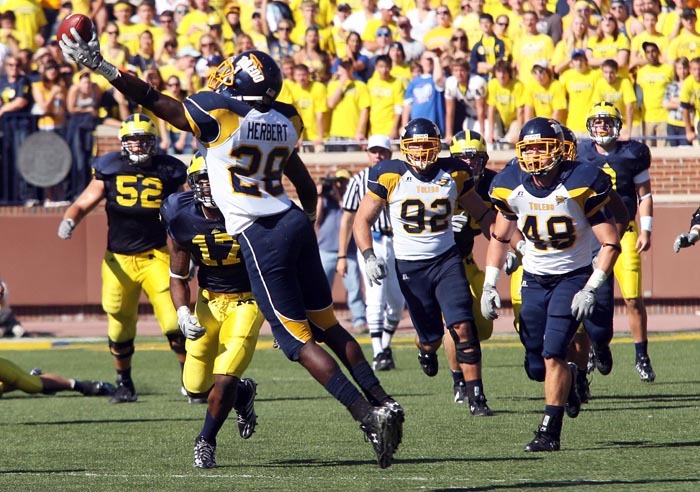 That play was later a nominee Pontiac Game Changing Performance on ESPN. I did get a pic of it but its trash because it was of his back but later in the second half. I got Herbert getting another interception this time a 1 handed catch from behind. After I sent this picture to Icon Sports Media who represents me I got an email from Sports Illustrated Leading Off Editor asking if I could send the raw file of this picture because there is a good chance that it will be a Leading Off Photo in the next and upcoming issue I am pretty pumped about that. Also I sent some of the celebration shots to ESPN the magazine and they will let me know on Wednesday if they want to use the imgages of the celebration that I got inside the locker room. I am pretty pumped and so are they other guys on the team for me because they also want to see the picture published in a magazine as big as Sports Illustrated. So I will keepe every one posted. As the game went on he was low scoring and Toledo’s defense played amazing. As the fourth quarter came close to an end Michigan was driving down the field and had a chance for a last minute field goal, But Michigan kicker missed a 28 yard field goal wide left and we won! 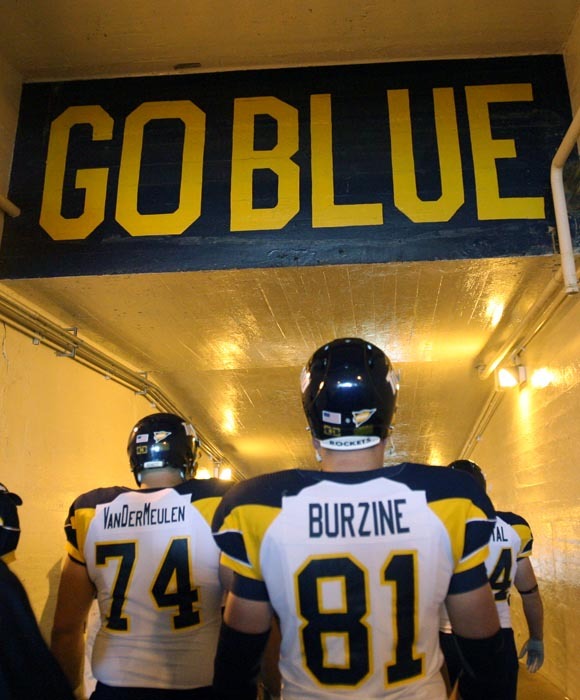 We just defeated the University of Michigan in front of 107,000 people. Next game will be at Northern Illinois. Be sure to check out http://aweberphoto.solo.photocore.us/sets/47246 for more photos of the game comments are welcomed and encouraged! 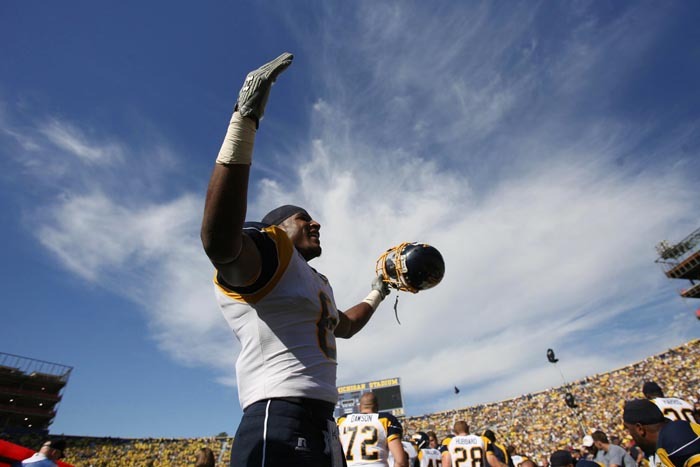 This entry was posted in Football, Toledo, Uncategorized and tagged defeating, Michigan, Toledo. Bookmark the permalink.